As students juggling assignments, presentations, projects and other co-curricular activities, more often than not many of us feel like our time has been stretched too thin. 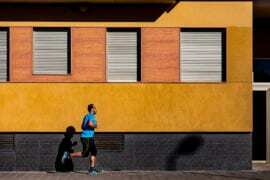 The solution to this would be to learn how to manage our time properly, but there is another solution that some might have overlooked: Utilizing tools that enable us to work more efficiently. As a self-confessed tech geek, I have tried and tested numerous applications, trying to find the best apps that would enable me to work better. Over the years, I have fallen in love with many applications and discarded even more. In this article, I will be sharing 5 of the applications I use regularly in my life as an undergraduate. One of the problems I faced when doing research is organizing all the literature (i.e., journals, PDFs, eBooks, conference papers, etc.) I gathered from the Internet. The more papers I wrote, the more literature I collected and the more confused I got with all my resources. The second problem I faced was that I hated having to manually key in the citations according to a specific citation format. I spent a long time just writing, sorting and editing the bibliography of my papers, time that I could spend doing something else. Mendeley solved both of my issues (and other issues I did not even knew existed!). Mendeley is a free reference manager that helps you to organize your research, collaborate with others online and discover the latest research. Mendeley allows you to organize your literature into folders and then sort the literature in those folders according to author, title, year published, and even the journal title. It also allows you to highlight and insert notes directly onto the PDF itself, thus making it easy for you to locate the important information you found earlier. It has a search function that allows you to search across all your documents, both in the titles of papers and their contents. 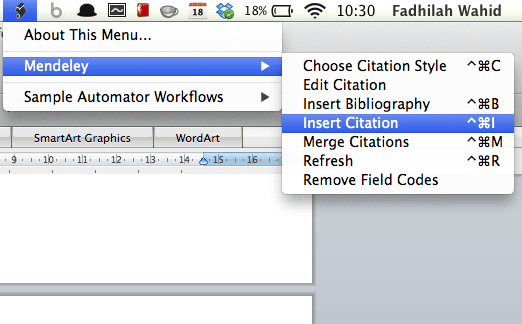 It gives you the ability to insert citations automatically, according to the format you require (side note: you will have to install the Microsoft Word plug-in here first). After inserting citations throughout your paper using the Mendeley plug-in, all you have to do to insert your entire bibliography is to click the above button. Mendeley will extract all the information automatically and create your bibliography for you in seconds. Since I started using the app last year, I have never found the need to find another application to replace Mendeley. It does what it is supposed to, is beautifully designed compared with other similar apps I have seen and saves a lot of my time. The 2GB online storage limitation is not that big of an issue as it should be enough to store hundreds of files. If you woud like some other apps to compare Mendeley with, you can check out the company’s useful comparison chart here. When doing qualitative research papers, I often had to transcribe hours of interviews. It was excruciating having to go back and forth between my audio player and my word document, pausing and rewinding, while trying to catch what my interviewees were saying. oTranscribe provides you with the one and only interface you need to do your transcribing effectively. oTranscribe is a free web app that aims to take the pain out of transcribing recorded interviews. It takes only one click to upload your audio or video. No registrations or sign-ups needed. Since you do not have to take your hands off the keyboard, oTranscribe gives you the ability to type faster. To pause and play, press the “ESC” button. “F1” rewinds, “F12” forwards, and “F3” and “F4” slows down and speeds up the audio so you can better listen to your interviewees. The best thing about oTranscribe is that when you pause, it automatically rewinds the audio for 2 seconds, so your fingers have time to start typing again when you hit “play”. Another feature I really like is the ability to timestamp. Often during recorded interviews, you will come across unclear audio. What timestamp does is that it marks the time of the audio on the document, so you can just click on it to give it another listen later. The audio will then automatically skip to the time shown on the timestamp. 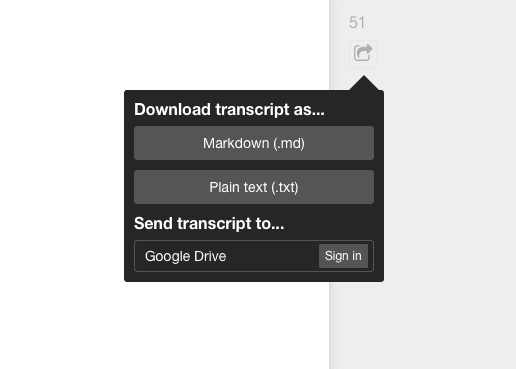 Lastly, the app also allows you to easily export your transcript in markdown or plaintext, allowing you to open it with your Word program. For those using Google Drive, you can also export it directly into your Google Drive account. I have shared this app with numerous friends and all of them testify that the app gets the work done effectively. The limitation of one transcription at a time can be an asset, as it forces you to concentrate and complete each audio before moving to another. Also, if you have audio and video files that are not within the accepted formats, you can convert your files using media.io before uploading them to oTranscribe. University life is such that every student has his/her own schedule, personalized according to the subjects he/she signed up for. While this allows for more flexibility and freedom, it can cause a problem when trying to schedule a time for group discussions. Case in point, I recently had to meet 9 team members for a project I was working on. In the past, I would have to liaise with them by going back and forth, trying to find a date where everyone would be free. With Doodle, all I had to do was key in the time slots where I would be free, send my team members a link and wait for them to choose the slots where they are free! Doodle is an app that simplifies the process of scheduling events, whether they are board or team meetings, dinners with friends, reunions, weekend trips, or anything else that needs scheduling. It is very easy to create a new event, for example a meeting, and choose the times that you propose the meeting be held. Once you have selected all the time proposals and completed setting up the poll, all you have to do is send the link given to your team members. 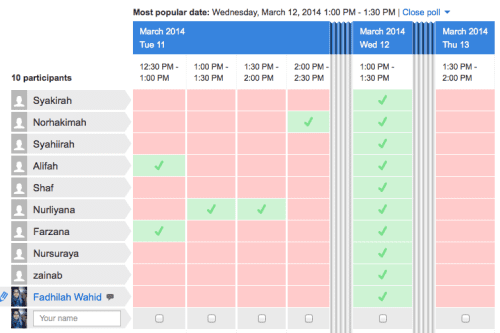 It is also very easy for your team members to choose their preferred time slots; they do not even have to register for Doodle! All they have to do is to click on the time slots they prefer and click save. 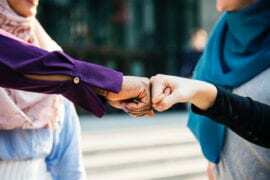 When everyone is done selecting his/her slots, you can view either the most popular slot to have a team meeting, or the slots where every team member is free to meet you individually. I have only recently stumbled upon Doodle, but I can foresee myself using it even in my personal life, from organizing dinners with my family and friends, to scheduling meetings for work purposes. When it comes to designing slides for presentations, the golden rule often overlooked is that less is more. Presentation slides only serves two purposes: To give the audience a simple visual aid in line with the content of the presentation and to remind the speaker of what he is supposed to speak of next. Because of these reasons, I only need an application that provides two kinds of content for my slides: Beautiful images and clear fonts. Bunkr gets that job done. With just a few clicks, Bunkr is an application that allows you to create an interactive presentation and to share it online. Bunkr’s interface is simple and minimalistic. This forces you to focus on what is important to include in your slides, so when you present, the audience’s attention is on you, not on your slides. Under the tab “web services”, you can even search for images in the Internet from within Bunkr itself. … you can then insert these content into your presentation slides directly! And when you are done, you can easily access the slides you designed using the link provided (Here is an example I did for this article!). Alternatively, you can also export the slides to PDF or PPTX format. Personally, I feel Bunkr is only for those who love simplicity in their presentation slides. Students who love to fill up their slides with lots of information would find Bunkr’s minimalist approach very limiting. As of now, Bunkr is still in its Beta phase. This is good news as it means that we can look forward to more features from the Bunkr development team in the future, In sha Allah. As representative for several classes, often I had to distribute readings and handouts to other students. Before discovering Dropbox, I would leave the set of notes at the photocopy shop on campus and anyone who wanted the notes would make their way to the shop, print a copy and bring the notes to class. This worked really well until it dawned on me just how much paper was wasted in the process! With Dropbox, however, my lecturers would send me the soft copy of the notes and I would upload them to my Dropbox account. I would then send an email to everyone who registered for the class to download the notes from my account. This way, consumption of paper decreases (as almost everyone has tablets or smart phones these days), the notes get delivered directly to everyone’s inboxes and because the notes are sent as a Dropbox download link instead of an attachment, email space is also saved. Dropbox is a free service that lets you bring your photos, docs and videos anywhere and share them easily. Uploading files and adding folders is very easy to do in Dropbox. Just click “upload” and choose your file. If you have the desktop app installed, you can just drag the file you wish to upload into your Dropbox folder. It will automatically sync across all your Dropbox-enabled devices. Files synced to your mobile devices can be stored offline for viewing without Internet connection as well. Sharing files and folders with anyone is just as easy. All you have to do is click “share”, and “get link”. The link to download your file will then be automatically copied to your clipboard, so all you have to do is send the link out via email, Facebook or other text-enabled applications. When a person clicks on the link you sent, all she/he has to do to download the file(s) is to click on “Download” and choose one of the above two options. Dropbox is the perfect application for online storage for me as it is very easy to use compared with other applications. There are also a host of applications that can work with Dropbox, such as Droptunes (stream audio from your Dropbox) and Scriptogram (blog from your Dropbox). However, Dropbox’s offering of free online storage begins only at 2GB (and caps at 16GB), increasing only when the user completes certain actions like recommending friends to join Dropbox. On the other hand, Box automatically offers a 10GB free online storage space, while Google Drive’s offer begins at 15GB. Dropbox’s 16GB of free space should be enough for most users, but if you are ever in need of more, do what I do – use all three applications. Quip: Online word processor that allows collaboration of documents. I use Quip to take down notes in class. Available for iOs Android and the web. Simplenote: The best way to keep simple notes. I use it to catch any idea or thought that comes to mind. Available for iOS, Android, Mac and the web. Trello: Organizer, to-do list, program planner, ideas board, resolutions tracker. Trello is as flexible as you deem it to be. I even use it with my news team to gather news daily! Available for iOs, Android, Windows 8/RT and the web. Feedly: A news aggregator application. Whenever my favourite websites update, Feedly pushes all new content automatically onto its dashboard, so I do not have to go to all the different websites. Available for iOs, Android and the web. In conclusion, I hope you will give the above applications a spin and I know, In sha Allah, they will help you save hours of your precious time. If you know of other awesome applications that I should try out, please feel free to share them in the comments. I would love to hear from you!